Click on the above sepia image for the color version. I am pretty booked drawing sequentials these days so I didn't get the chance to illustrate a new radio show of the Shadow, but I wanted to chime in anyway since it's Sunday and give you a sneak peek at "Lullaby", a short story I am doing (story and art al together) for "Outlaw Territory" Vol.2, a collection of Western tales edited by the good Michael Woods and (soon to be) published by Image Comics. I will make sure to post order code and release date when I will know them: meanwhile I hope you enjoy this first page (and the finished inks + intial rough version below). "No One Can Quarantine The Shadow!!!" with issue 10 of Zorro coming out anytime now, I thought to share my back covers for issue 9 and issue 10. The back covers are some sort of "preview" of the next issue, so expect to see some tar pits and Jurassic bones in issue 10 ;) While in issue 11 Zorro will get close to the big bad guy of this second arc. I will make sure to post the original inks of the front cover when the book hits the shelves but for now I hope you guys dig these "coming next... on Zorro!" That's right, finally, after a few months, we get back to those old pulp radio episodes of the Shadow: I hope you are as excited as I was today :) Let's get soon to it, without any more delays. A series of apparent suicides brings Lamont and Margo to investigate an old story about a chemist/painter, Albert Gerner, and his famous painting "The Lady in Black". The subject of the painting killed herself after being portrayed, or this is what the artist said before disappearing himself. The shadow will find the truth behind the mystery of "The Lady in Black", and this time Margo's notes will result to be very helpful in solving the case. No, this is not a missing novel that just came out (even if it would be GREAT if it was true). This is just me tributing two great men who helped to make the Pulp world richer and greater who recently passed away: Donald Westlake (Richard Stark), crime-fiction writer and Parker series creator, and Edward D. Cartier, artist and illustrator of many pulp novels, especially The Shadow which is so dear to us. The fake cover below is what came to my mind when trying to do something with Parker and The Shadow together. The design is inspired by actual Parker novel covers. Thank you Chad and Cohen for the heads up and thank you Donald and Edward for entertain us and all the fans before and after us. I wanted to celebrate my 100th post with a strip but work got in the way (even if I haven't abandoned the strip) so I thought what better than the Shadow to celebrate a blog that was inspired by those radio shows? The above is a commission I recently did for our own friend Ilia: he asked for some action and I gave him a big chase in Little China :) Hope it was worth the wait, Ilia. I wanted also to beef up this post with a great news: I was lucky enough to be invited to illustrate an issue of Scalped (#27), the critically acclaimed series created by Jason Aaron and R.M.Guera and published by DC Vertigo. I have been fan of this series since day one so you can imagine how excited I am to draw one of the stories written by Jason. For those of you who are not familiar with this title, it's one of the top noir, gritty book out there (the other being Criminal by Brubaker and Phillips). I greatly suggest to hunt down the trades if you guys haven't got on this book already. I'll make sure to post some preview pages when I can, but right now I hope you enjoy the promo art below. 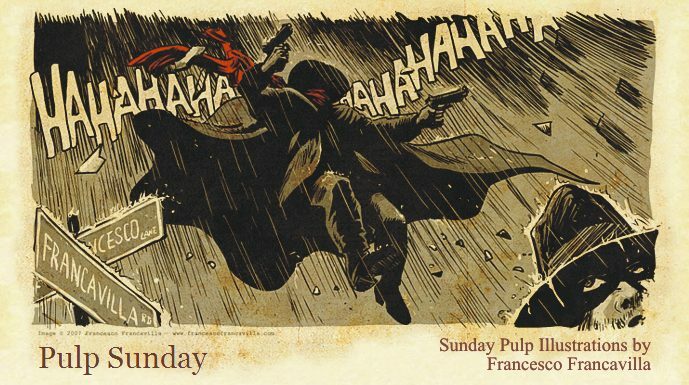 Cheers to you all and cheers to more Pulp in 2009! Click on the sepia image for the color version with pre-order info.